While the Region 2 model turn-out was pretty low, several chapter members brought home trophies and medals for their models – Congrats to all. The real draw for me, and others, though, was the Biplanes and Triplanes Airshow, with a close 2nd being the museum’s collection of warbirds and vintage civil aicraft. Show performers included everything from the dawn of flight through World War I and just beyond. Early flight was represented by two aircraft, the first being a Curtiss “D” Pusher, like the one that made the first launch of an aircraft from a ship by Eugene Ely from the U.S.S Birmingham, just off the coast of Virginia, and a Bleriot monoplane. 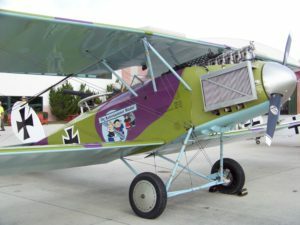 WWI combatants included everything from a Fokker E.III Eindekker, Albatros D.V, a Halberstadt 2-seater, a Nieuport 24, Sopwith 1 ½ Strutter, a Fokker Dr.1 Triplane, two Fokker D.VII’s, a late-war Fokker D.VIII (my personal fave) and post WWI Fokker C.1 (basically a two seat Fokker DVII). While all of these aircraft are replicas, and most do not have the original engines, it was great to see hear them start-up and see them fly. If you want original engines and WWI aircraft I strongly suggest you check out the Old Rhinebeck Aerodrome in upstate New York. 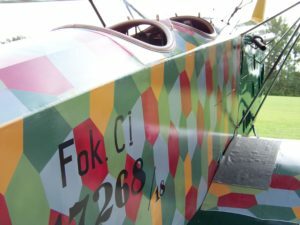 There you can hear the real “buzz and blip” of vintage WWI engines – and there’s nothing like it. The show only lasted from 1-3pm, which was a good thing, since it was hot and humid down there. If you got overheated, though, all you had to was duck into the museum’s air-conditioning. Everything was very close and accessible, unlike some airshows, where the action is very far away from the crowd. That’s my kind of airshow. The museum’s collection include some great examples of original pre-WWII and WWII warbirds, too, including a Hawker Hurricane, a Bf-109G6, a PBY-5 Catalina, a Boeing P-26 Peashooter, a Focke Wulf FW-190D-9, a host of Russian Polikarpovs (Po-2 biplane, I-15Bis, I-153 Chaika and an I-16 Rata), as well as a, Yak-3, Mig-3, Bell P-63, Lavochkin La-9 – most of which are original, several having been recovered from various swamps and forests in the former Soviet Union and refurbished by a New Zealand company). 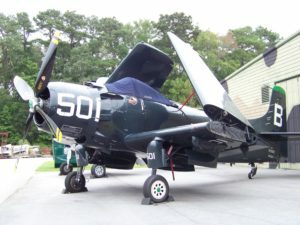 Rounding out the collection was a DeHavilland Mosquito and a P-40E, both which have performed at Reading PA), a P-51D, a North American P-64 replica (based on an AT-6 Texan/SNJ airframe), a B-25J, an FM-2 Wildcat, another Goodyear product in the form of am FG-1D Corsair, a Skyraider in 1950s Glossy Sea Blue camouflage and markings; and a host of others. 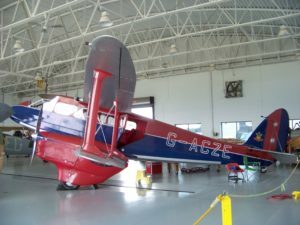 Other aircraft were hiding in various hangars, some under restoration or construction, including another Fokker Dr.1, a DH-89 Dragon Rapide, an original Curtiss Jenny, and more. You did not know where to look next. One wild looking bird was an Fw-190A replica in silver dope Luftwaffe finish, sporting a 4-bladed prop! 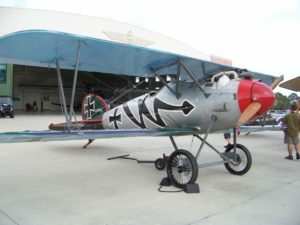 A docent explained that the ersatz Fw was equipped with a Czech-built engine (thus the 4-bladed prop) as well as, a totally “liquid” instrument panel – no gauges. They also have an original V.1 pulse jet engine, mounted to a test stand complete with fuel supply, but they did not demo it at the show. They did demonstrate a “‘real” WWI radial on an engine stand, with the radial engine itself spinning around with the prop. There were re-enactors in period costume, including my friend, Lynn Ritger, resident Bf-109 and Luftwaffe experten, who often lurks on Hyperscale. The museum has a couple of vintage vehicles, too, including a Ford Model T with a Hucks Starter, used to spin prop blades to get the engines going in the days before internal engine starters. Even the museum’s set of buildings included some museum pieces, the most notable of which are a WWII era control tower, of a type seen on most airfields in England, and the start of this example (wait for it, Marc Rocca) an original Luftwaffe wooden hangar that they dismantled piece by piece and erected down at the far end of the field. They even maintained the original graffiti on the structure’s beams (in Polish, I might add) written by the conscripted slave laborers who originally built the hangar. They usually keep the WWI aircraft in there. There was a crew from “The Hangardeck Podcast” there, with very professional equipment, interviewing people at the show, including me. I told them that guy they should really interview was not me, but none other than our local NJIPMS resident hero, and my friend for close to 40 years, Buzz Lockwood, which they did, thankfully, at length. By the time of our October meeting, or shortly thereafter, Buzz’s interview should be up and available. I would strongly encourage every NJIPMS member to check back at the podcast’s website www.thehangardeck.com from time to time to hear this interview. And here’s why…. The NJIPMS attendees, and friends of NJIPMS, were treated to a very personal and intimate version of Buzz’s story on Friday night at the club’s usual convention get-together, this time held in Big Bill’s hotel room at the Schooner. It was a real privilege to hear Buzz’s stories about his service as a Loach and Cobra Gunship pilot during the Vietnam War in that intimate setting. It wasn’t long before he started to direct “his message” toward the young teenagers in the room – namely Bills’ protégé (aka as ‘boy”and his friend, Mike). Say want you want about the short attention span of most of today’s youth, these two young guys were transfixed, listening to both the specific stories and the philosophical message inherent in what Buzz was saying. They hardly moved a muscle; and the same could be said of the adults in that room. Now, I have heard quite a few of his stories over the years, especially during our long trips together traveling to the meetings, and during our dinners before the meeting, but it was quite something to witness that whole group hearing it at the same time. Buzz does not often share these stories, even with guys he’s been friends with for years. He took great pains to say he did not consider himself a hero, perse, but simply stated that he and others just did what they had to do when the time came. Looking from outside those acts more resemble the tribute that Admiral Chester Nimitz made about Marines in combat in Iwo Jima, namely that “uncommon valor was a common virtue”. He then went around the room, singling out Pat O’Connor’s service as a Volunteer Fire Fighter, stating that every time Pat goes out on a call, he puts life and limb on the line. I really identified with that, since my eldest brother, Dan, is a Newark Fire Department vet, now thankfully, retired. Kudos to you Pat – thank you for your service, too. Big Bill made sure to underscore that those two teens understand the meaning of what they heard that night. I think they did. I think they’ll remember it for years to come. Don’t get the wrong impression, though. This get-together in the hotel room was not just a solemn occasion. We had a blast telling dirty jokes, talking about aviation, models, movies and just about everything else under the sun. That’s one of the other best things about going to these shows. The beer flowed freely, spiked with tequila sipping shots for Big Bill, the Birthday Boy. We got so loud and raucous, that the hotel manager came up to warn us about the noise level, namely that if they received one more complaint, we would be thrown out of the hotel! When I was back in college, if the cops didn’t show up at our fraternity parties, we didn’t consider it a good party – same here. And while I’ve been to dozens of hospitality suite confabs at shows over the years, this was truly one for the history books. The other thing about VAB is the constant free airshow (especially F-18 Hornets and E2 Hawkeyes) that goes on day and night over the beach, courtesy of NAS Oceana, the USN Amphib Base at Little Creek and the nearby Norfolk, VA, USN base. Most of us stayed at the Schooner Hotel at the southern end near the inlet. Pairs of Navy Seal boats roared in and out of the inlet. Ospreys thundered past our balconies. Seahawks hovered and, one morning, the nuclear powered carrier the USS George Washington sortied out of Norfolk in the distance (later I found out the intent was to have her positioned offshore in the event that her power plant was needed for emergency service providing power to any Hurricane Matthew ravaged coastal city). Thanks also goes to Big Bill for organizing the dinners and other attractions the club members and friends of the club went to. Bill was stationed at Oceana late in his career and knows VAB like the back of his hand. The next club outing is the Maraudercon Show in Harve de Grace in Maryland. Buzz and I will be trucking down together from the Keystone State. This venue is a short trip from all points in Jersey, so if you want to be part of the fun with Big Bill as the Ringleader, be there, or be square.